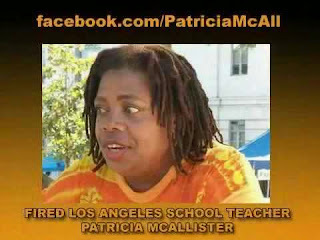 A substitute teacher no longer has a job with the Los Angeles Unified School District (LAUSD) after footage of her anti-semitic views surfaced. In an interview given last Wednesday to Reason TV during an Occupy LA protest, Patricia McAllister identified herself as a teacher with the LAUSD. She then said, "the Zionist Jews who are running these big banks and our federal reserve -- which is not run by the federal government -- they need to be run out of this country." Jews have been run out of 109 countries throughout history, and we need to run them out of this one. And of course, channeling Eustace Mullins, a "populist American political writer, biographer, antisemite, and Holocaust denier". Yep. It figures.